Gamers, rejoice! The wait is finally over!! AeroCool's new PGS case, the B series BX-500 is now among us. This thing totes some serious airflow capabilities, and with out-of-the-box capacity for up to 10 fans, it can only get better! Good cable management, anti-vibration reinforcement, support for extended ATX boards, and dust filters all come standard, of course. And AeroCool has even been so kind as to pre-drill pipe holes for those of you who want to shove some water cooling in this bad boy! 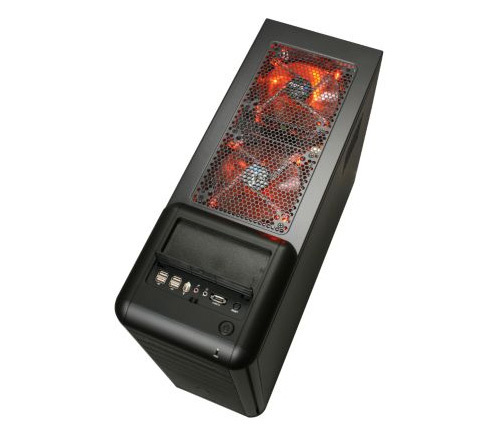 High performance "Super Mid-Tower" case for gamers and enthusiast – supports all High-End MB including Extended-ATX. Beautifully finished front panel – the combination of aluminum and metal mesh . eludes “Class” and “Elegance”. High-end Graphic card Support – Supports longer high-end VGA cards up to 380mm. High Expandability – Supports 5 x 5 1/4” ODD devices, 1 x 3 1/2" device and 5 x Hard Drives. HDD and PSU Protection – Includes anti-vibration rubber to protect your HDDs and PSU from shock. Ease of Installation – Screw-less 5 1/4” bays, 3 1/2” bay, HDD trays and PCI Slot make this chassis an easy install. The HDD cage is also rotated 90 degrees to help .ease Hard Drive installation. Easy Access top I/O ports – 4 x USBs, Audio/Mic, 1394 and e-SATA ports are located on the top panel for easy access. Smart Cable Management – “cable management clips” are pre-installed inside the chassis to minimize your cable mess and improve the system airflow. As this chassis can support 10 fans, Aerocool pre-installed 2 units of “fan adaptor PCB boards” inside the chassis to help you tidy your fan connections. Dust Protection – Includes front "Dust Filter" and bottom “Dust Filter” to prevent dust. entering your computer. Un-rival Airflow – install up to 10 fans !! !